He use Draw In - All members need to fight close to the mob to not interupt any 2 hours going on. Especially not the Chianspell Stuning. Sweet Breath - Area of Effect sleep ranging ~25' in a big circle around the mob. Sleeping is not what we came to einherjar to do. Pop a ppoison pot before we engage. And this sad move will be of lesser concern. Also mages - Make sure you guys especially do not fall asleep. Next move is more or less a real pain. Bad Breath - I guess most of you allready know what this is, but for thoose who don't it induces Silence, Poison, Blind, Bind, Weight, Slow, Paralyze on all people geting hit. Good thing is its a cone attack so all of you who are lucky enough to be on another side of the mob will be spared. Vampyric Root - Is not really a problem. What it does is it absorbs the buffs "you" have on you if hit. Basically let closest Red Mage know if you where hit so we can dispell it. Is absorbed by Utsusemi so make sure to do your best with shadows etc. There are reports stating that he use his TP moves in a pattern. Wich means he is supposed to use 3 not as panic infusing physical attacks first 3 TP moves. (Impale, Vampiric Root, or Vampiric Lash ) After this he will use one of the breath attacks. Good thing here is we dont need to be afraid of breath spamming etc. 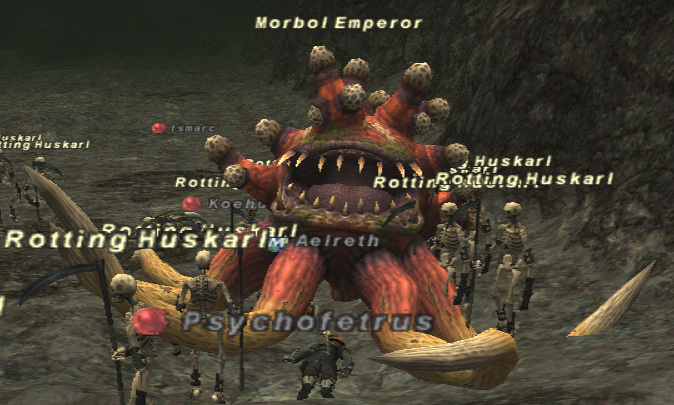 If you ever fought a morbol before, you probably know it have a very high attackspeed. Stuning will be a great asset as usual. The sooner he ends up dead the better. Try to land all debuffs on him, especially Paralyze is helpfull. Just stay focused and we are home free.